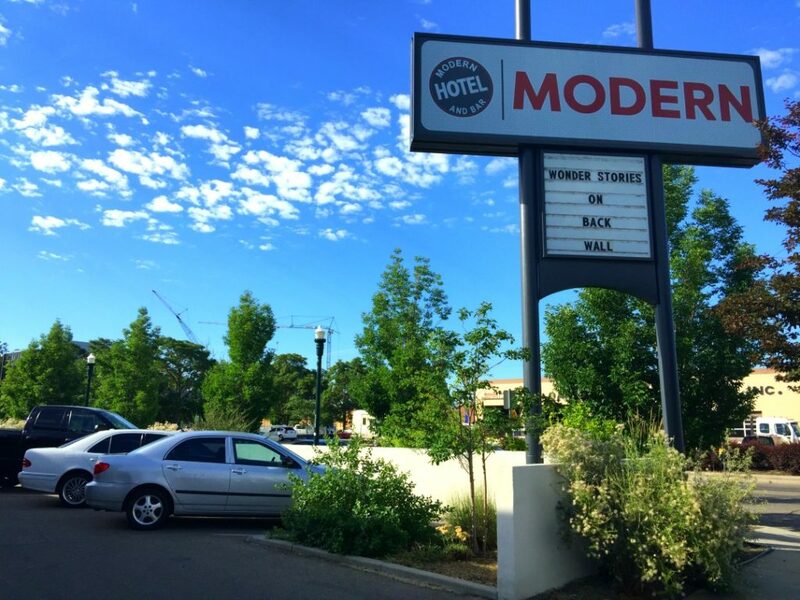 When I first heard Boise had a hotel called Modern Hotel I couldn’t wait to stay there–of course, because I am the Modern Traveler and I couldn’t resist the idea. 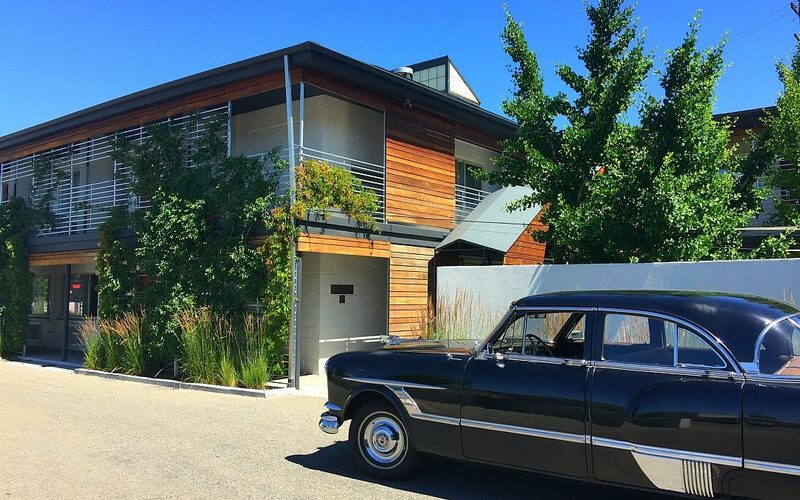 I love a modern aesthetic and I also appreciate history and vintage Americana. 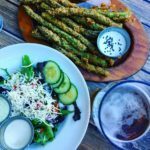 The Modern Hotel offers a little of both, and some ridiculously good food and drink to boot. The Modern is a refurbished Travelodge. 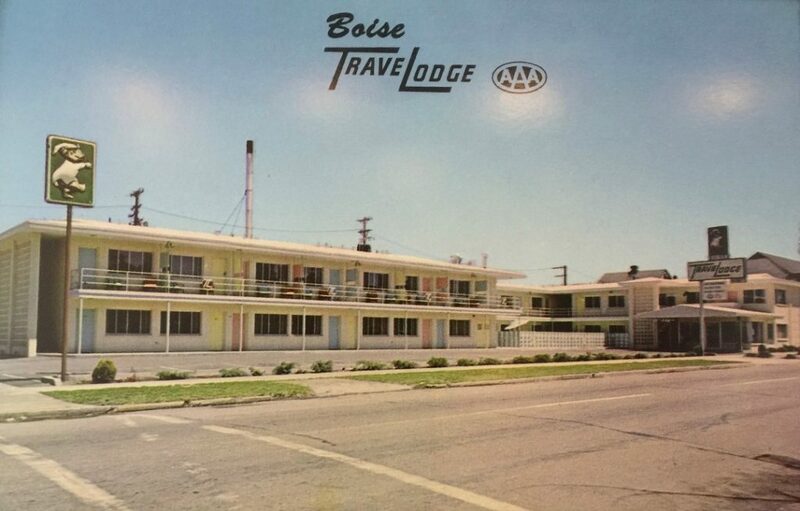 Idaho has a fascinating Basque history and the Modern Hotel has its roots in Basque immigrants. During the Depression, a Basque sheep herding couple decided to open a boarding house after losing their sheep. The boarding house centered around Basque immigrants, sheep herders and other travelers. 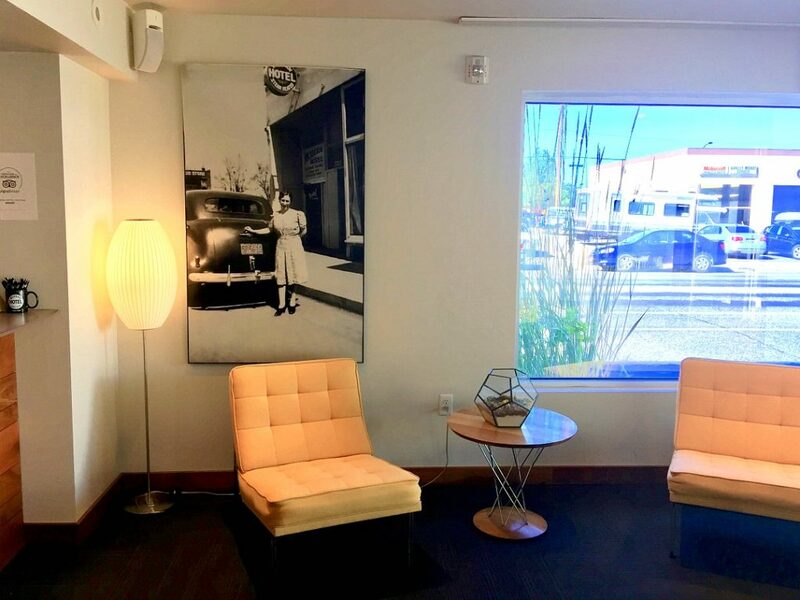 Sixty years later, the couple’s granddaughter, Elizabeth Tullis, purchased an old Travelodge, naming it after the original Modern and refurbishing it to reflect a mid-century modern influence and an intimate, welcoming vibe. I’m guessing the photo in the lobby is Regina Echevarria, Elizabeth’s grandmother. 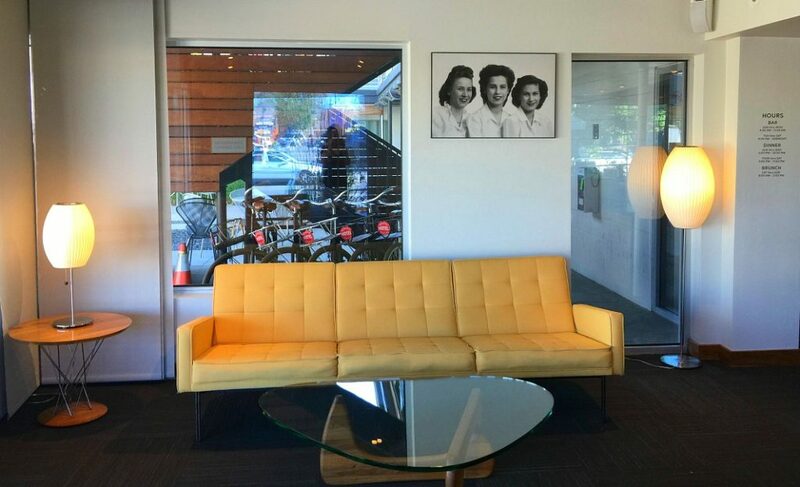 Sunny yellow mid century modern furniture and retro photographs create an uplifting introduction to the hotel. I’m old enough to remember the brand Travelodge, and could swear that growing up we stayed in these during family road trips. There is a feeling of nostalgia here, and a certain swagger of that era. Lately I’ve been craving simpler times, so it hit a soft spot for me. 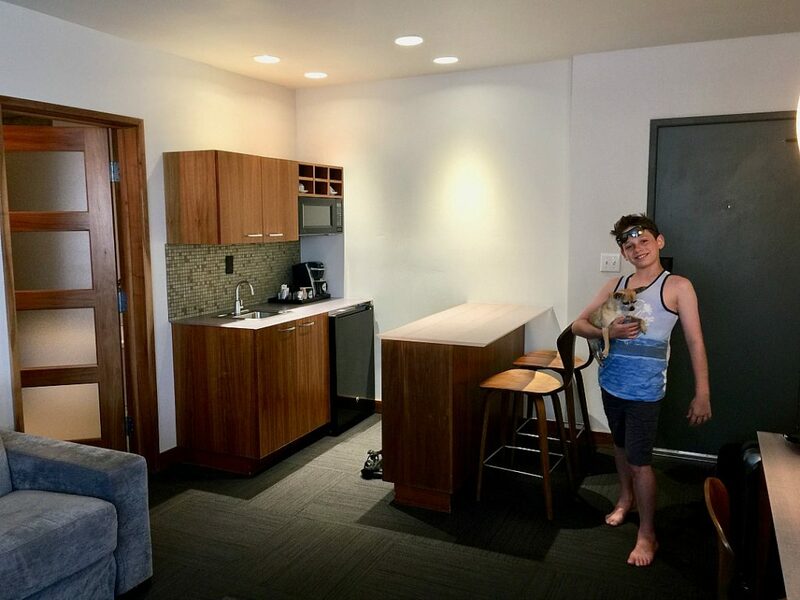 We had a suite with one bedroom, living room with fold-out sofa, kitchen area, and gigantic bath. It’s minimalist which is a look I appreciate, though I thought the blank spots on the walls begged for artwork. 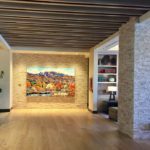 This hotel has an interesting personality, and I’d love to see some art to lend the color and expression that matches the creative energy of the place. 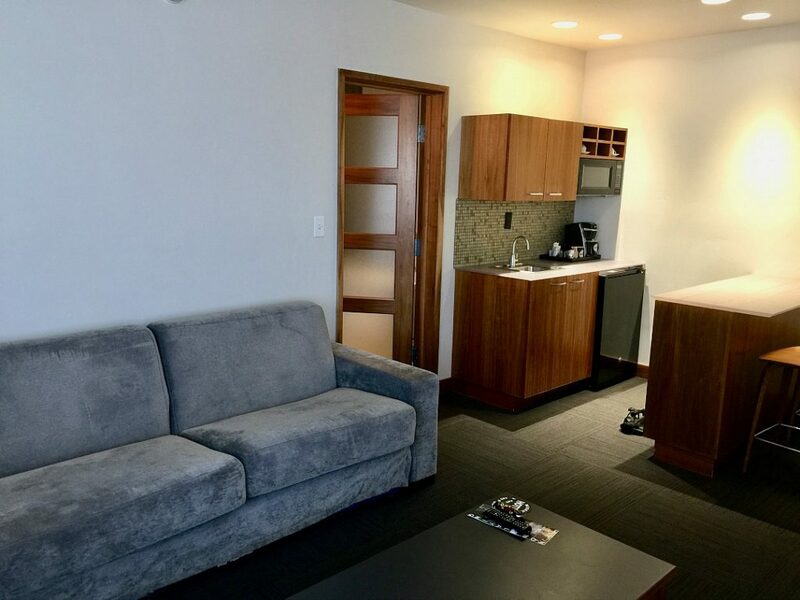 The living room space has a comfortable contemporary silvery gray fold-out sofa bed, and there are TVs in the living area and bedroom. It was really nice for my son and I to have some separate space. 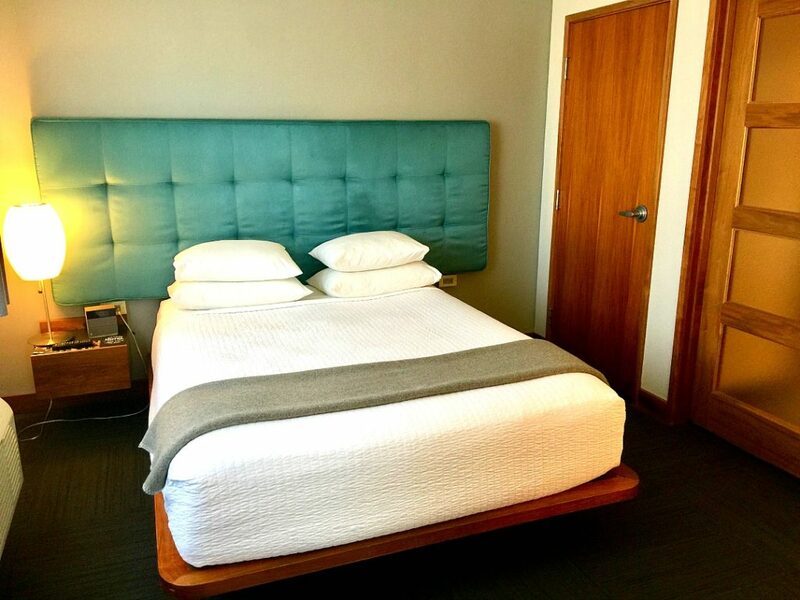 An aqua satin headboard, Nelson Bubble Lamps, platform bed and butter soft quilts create a comfortable atmosphere in the bedroom. The bathroom is huge. 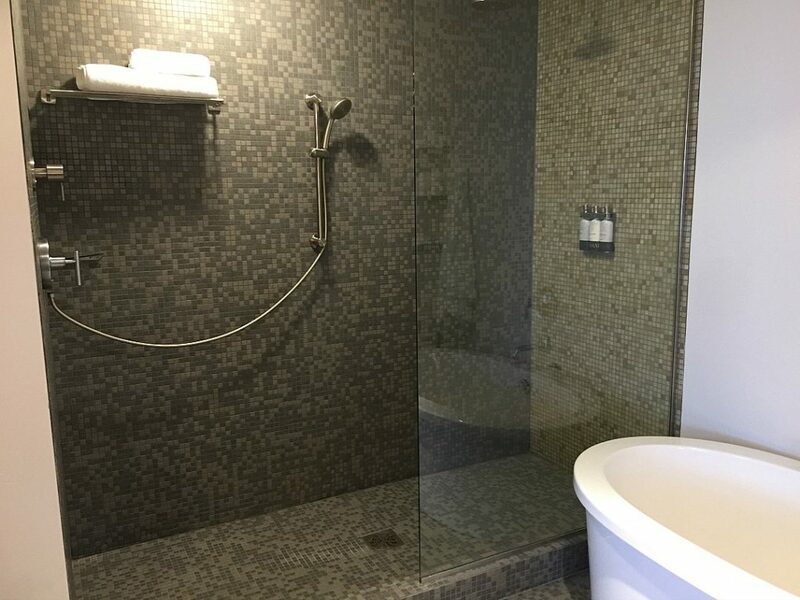 There’s a large shower and soaking tub. 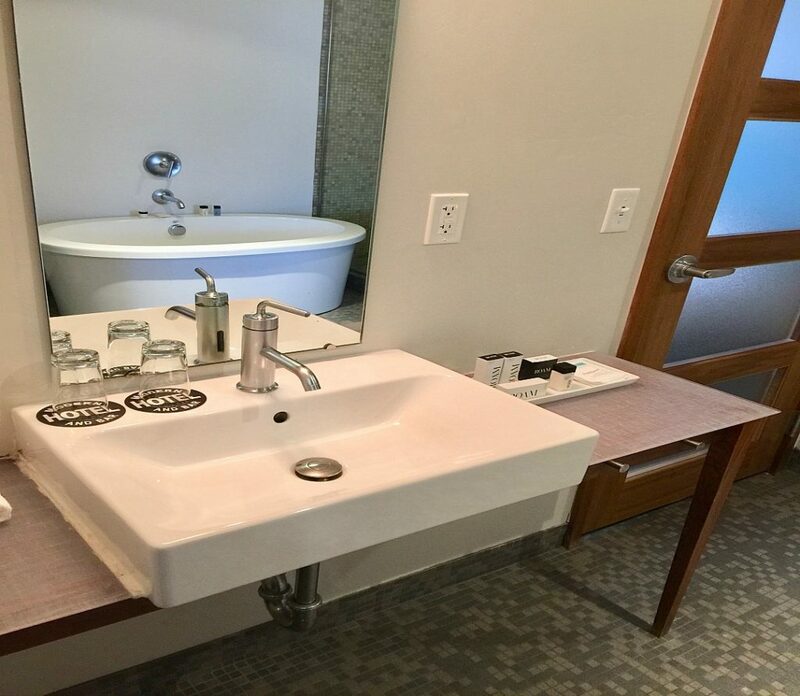 I like the square, oversized sink and modern fixtures. We were active on this trip with river rafting, cycling, and lots of walking. We both appreciated the big soaking tub to soothe achey muscles. 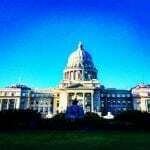 I travel with Aura Cacia bath salts for such occasions and enjoyed a muscle-relaxing lemon salt bath. 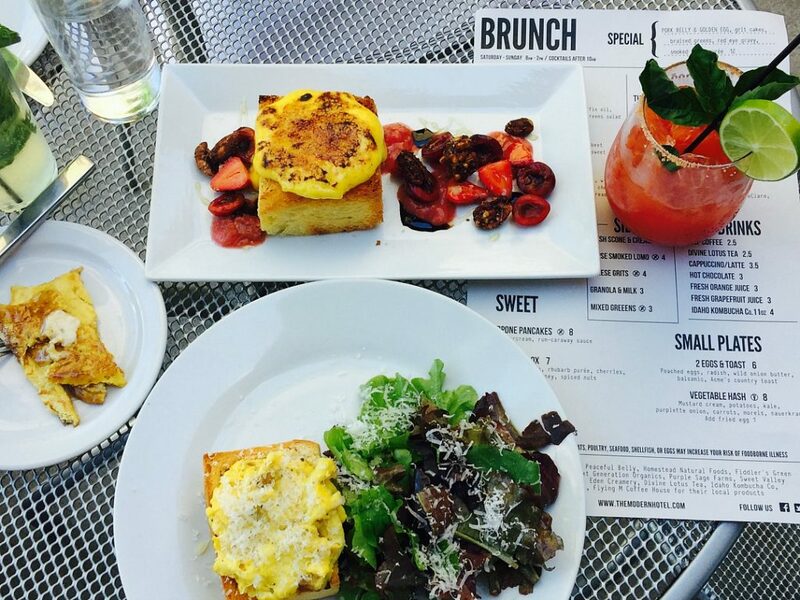 You have to experience brunch at the Modern, featuring locally sourced organic ingredients. We loved it so much I wrote a whole post about it. You can read about that HERE. 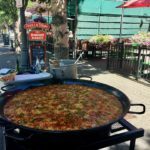 If you’re a foodie, you can’t visit Boise without experiencing this brunch, it’s a meal we will never forget. In ten years, we will still be talking about it. Everywhere we went the sentiment was echoed–the bar at the Modern Hotel has the best cocktails in town. 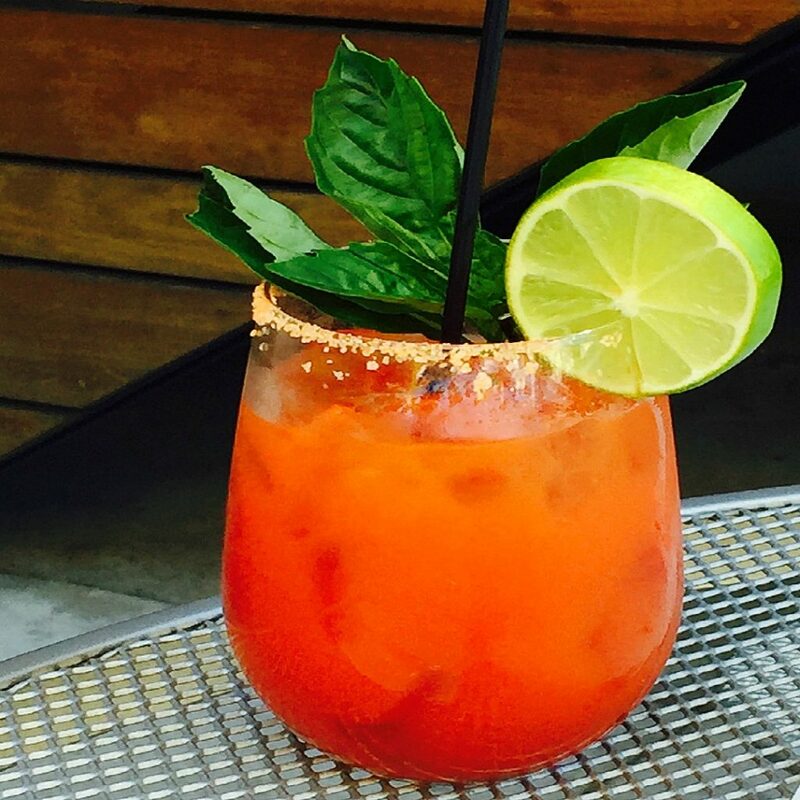 With my brunch I tried the Bloody Maria (they got me with the Thai Basil) and it was spectacular. I’ve never liked them before! Locals come here to imbibe craft cocktails made with fresh ingredients and enjoy the unassuming, relaxed atmosphere. 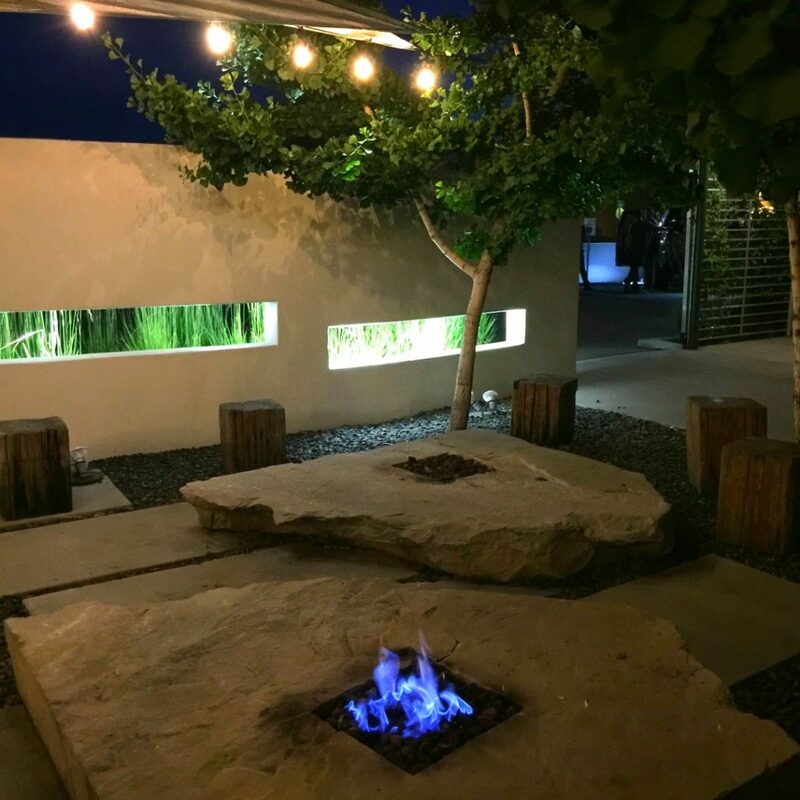 The patio is an especially popular place to enjoy an adult beverage on a summer night surrounded by fire pits and bistro lights. There are cool, triangular shades cover the patio to shield some of the sun during the day if you prefer a shady spot. 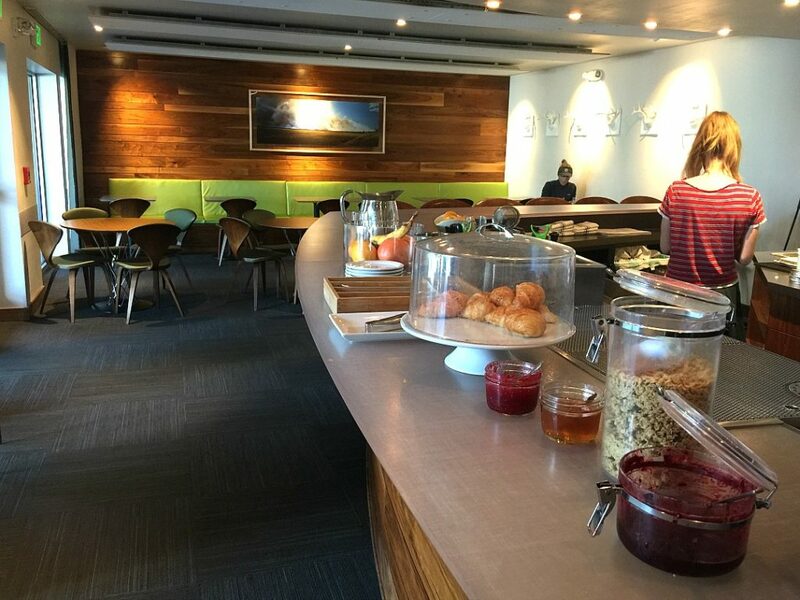 On weekdays, Modern Hotel serves up a complimentary breakfast consisting of fresh baked croissants from the local Gaston’s Bakery, Greek yoghurt, a fruit plate, delicious locally roasted coffee, and homemade jellies and berry compote. 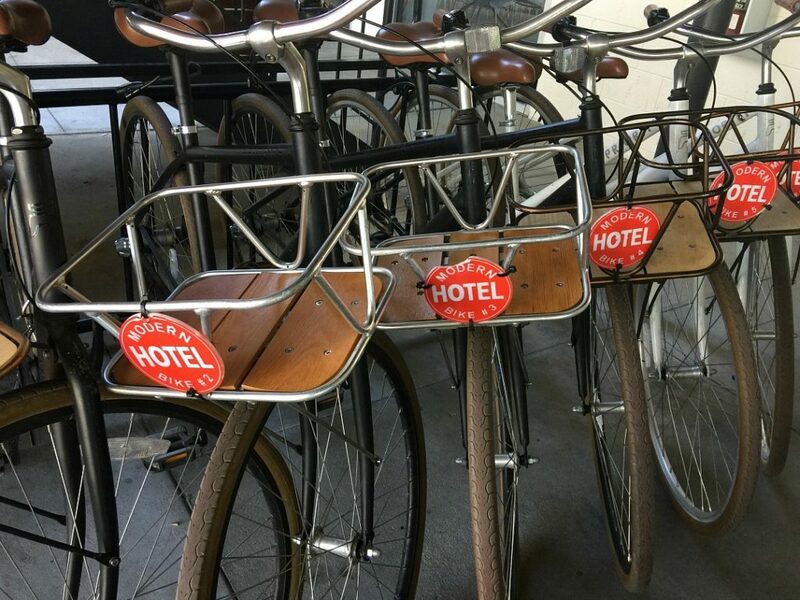 The Modern Hotel offers complimentary bicycles to cruise around town. We used them both days we were there and they made it quick and easy to get to restaurants and enjoy the greenbelt. You’re fairly close to the Greenbelt, it’s a few blocks away. 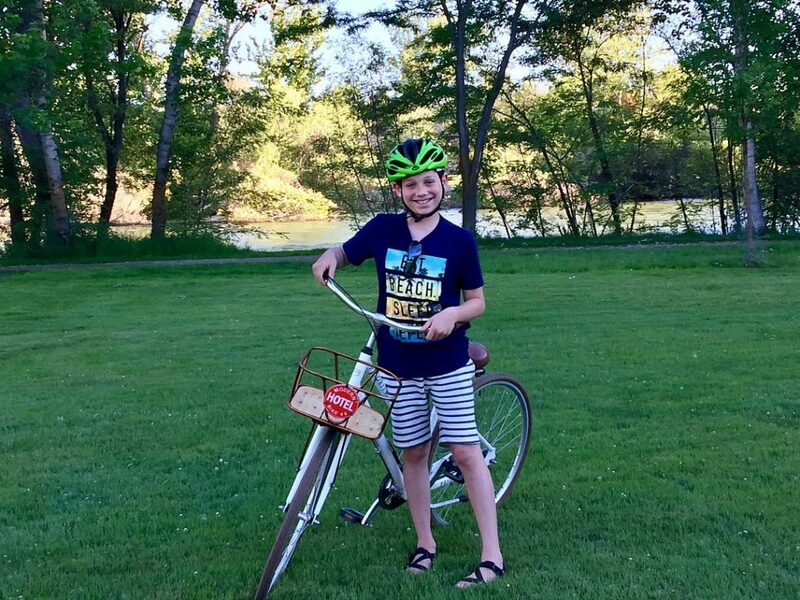 There are also parks to enjoy and shops you can bike to. If you have a suite, you can hop over to Trader Joe’s and get some groceries to prepare food in your room. But the food scene is so good in Boise I wouldn’t overdo in-room food prep, it’s just a nice option to have particularly for people traveling with children. Our dog had a comfortable visit with easy access to grass just outside the door. I always say we enjoy our trips so much more when we bring our dog, so we usually do. We love seeing other dogs when we’re traveling too. If you’re a dog-person, you know how comforting they are. It’s always nice to know canine family members are welcome. 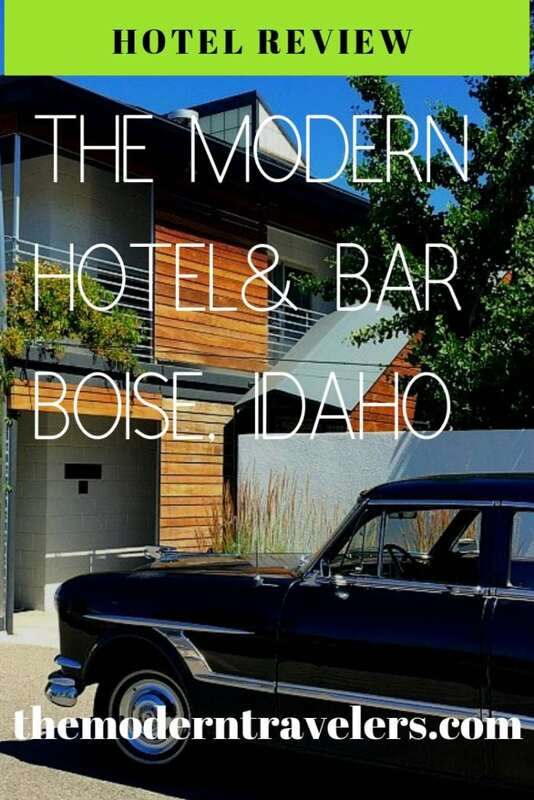 I would not classify the Modern as a luxury hotel (neither do they), but it’s quirky and fun and worth checking out. The staff is friendly, the vibe is low key and comfortable. 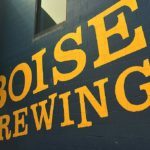 One thing that is good to know is that if you are sensitive to noise, you might want to avoid staying here on a Friday or Saturday night due to the drag racing culture on Main Street. It’s loud, and it goes on until about 1:00 am. 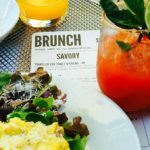 One way or the other, you still have to go on a weekend to experience the fabulous brunch, even if you are not staying here. 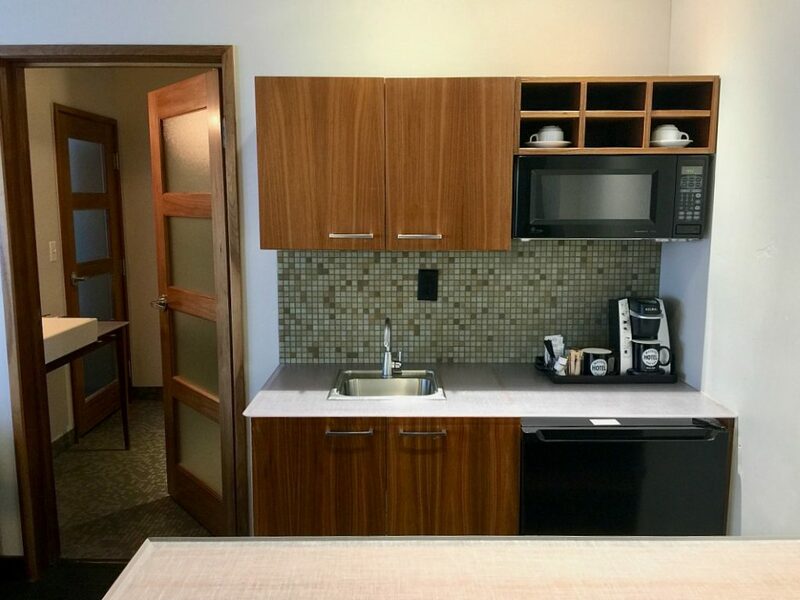 The Modern is a dog friendly, kid friendly hotel (motel) located in the downtown Linen District and provides complimentary bikes that enhance your stay with easy access to nearby sites and restaurants. They also offer complimentary shuttle service to and from the airport. It’s a refreshing hotel experience with heart. Find out more on the hotel’s WEBSITE. 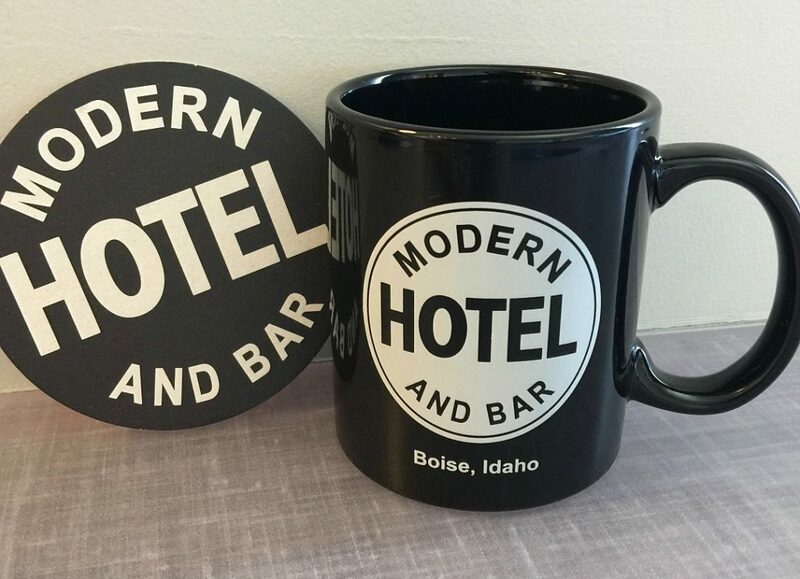 We were guests of the Modern Hotel and Bar, opinions are my own.